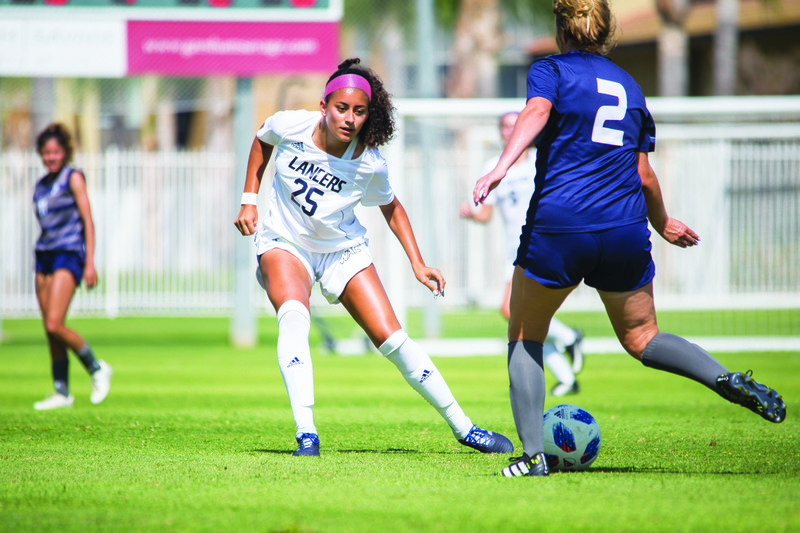 California Baptist University’s soccer is off to a solid start after winning its first matches in Division I. The women’s team has a season record of 3-1 and the men’s team is tied 2-2 in their first DI season, thus far. The men are coming off a 2-1 loss after a fierce battle against the University of San Diego, but Coe Michaelson, head men’s soccer coach, said he is not discouraged. Michaelson said that while a loss is disappointing he is impressed with the men’s adaptability to the new level of competition. The mental adjustment to the new division requires long hours of research. The players themselves said they are excited and devoted to playing their best every week. The women’s team is undefeated so far on its home turf, but lost ts only away game. Jordan Padgett, junior execise science major and center mid-fielder, said the team goal is to always outplay its opponent and that playing the first season as DI is a challenge the team is ready to take on. Padgett also said the team motto, “Designed to go far,” is something the team carries into every game. The womens team’s next match is a home game against Hope International on Sept. 21 at 3 p.m.